The 32 Watt adjustable head has a tight beam for easily signalling your dive buddies, and is much brighter than my Light Monkey 21 Watt HID. Since you can change the brightness with the switch, two steps down is equivalent to the 21 Watt HID, but only draws 7 watts, giving the 10 amp hour canister an almost 20 hour burn time! I will be testing out this slick undergarment in the 37 degree (F) Canadian water this summer. It wears like a midweight capilene undergarment with integrated front and back heat panels! An empty reel is the hallmark of successful exploration, and nothing makes that easier than light monkey reels. They don't jam, the line doesn't fall off between the frame and the spool, and you can actually feed the line through the gap in the water if you wrap the line up too far. Ever wonder where you should go for your next cave training course? Why not get trained by someone who is actually doing exploration, not just talking about how they used to do it. Edd Sorenson is my regular exploration partner on the Millpond in Jackson County, Florida, and has the end of the line in multiple caves in the panhandle, a position he has to constantly defend from myself and others. To do that, he is diving all the time. And I mean ALL THE TIME. 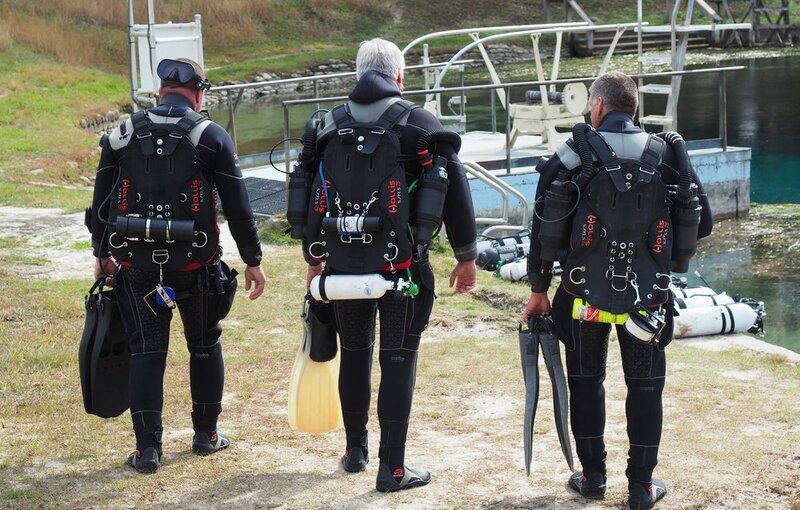 Stacy and Edd run Cave Adventurers (facebook) (home page), a full service dive shop right on the millpond. Here you can buy all the little pieces you forgot, all the way up to a number of fully kitted out rebreathers. In addition you can rent their pontoon boats to access the many fantastic caves on the millpond. Edd Sorenson teaching a KISS Sidewinder class at Jackson Blue Cave. Some of you have asked where to go to get the new KISS sidewinder that I am using- The answer is Edd at Cave Adventurers. He not only teaches a fantastic crossover and training course, but uses it for exploration, right there on the millpond. Two Silent Submersion Vipers, ready to go to 9000 feet to survey and explore at Jasper Blue Spring. Two Silent Submersion Vipers, back from 13,000 feet and the end of the line at Cow Crap Cave.